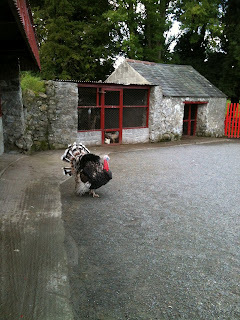 They give everyone a bag of food to feed the animals - Oliver couldn't quite figure it out right. An old farmhouse done up to look like a traditional Irish cottage. Oliver in front of the monkey enclosure - yes, monkeys! Donkeys and llamas in the playground. Lots of fun as you can feed the animals and touch them all - not like at the zoo! There were lots of covered areas so it would even be a good place to go when raining. 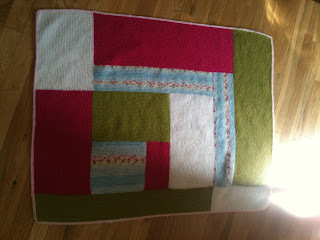 A better picture of the blanket - love love love these colours! Ballerina Bunny and Moderne Baby Blanket. Getting some of these ready for handmAid, which will be held on 22nd Sept this year, in Dublin. Last years event was for Oxfam, this year its for the DSPCA (Dublin Society for Prevention of Cruelty to Animals). I donated a few toys last year so they asked if I would again - hence all the gremlins. I think I'll be making some more gremlins though as presents for other people - they're pretty cool. They remind me of the Rebecca Danger patterns. These guys are quite addictive! Probably the hardest thing I've ever knit - but looks real good once done! Emily did some lovely colouring the other day, and I remarked at how beautiful and colourful the blanket was. A great day for Irish women - Congrats to Katie!